Last week, I got a chance to play Heart of Thorns, Guild Wars 2's first expansion. The demo featured both a small chunk of the new PvE area and the Strongholds PvP game mode. Here are my impressions of the MMO's upcoming jungle excursion. The pact fleet, on journeying deep into the jungle to take down Mordremoth, find themselves under attack. Mordy's a jungle dragon, and that gives him control over Syvari, the game's playable race of plant people. The Sylvari turn on their companions, and the fleet's airships crash into the jungle canopy. Their leaders—Trahearne and Destiny's Edge—are captured. Into this scene of devastation enters the player, and the Living World crew of Marjorie, Kasmeer, Rox et al. In the opening story instance, I meet up with Pact soldier Laranthir—a Sylvari. He tells us that soldiers are being kidnapped by Mordremoth's forces, and requests that we rescue them. Another Pact soldier tells us that Sylvari can't be trusted, and that instead of walking into Laranthir's probable trap, I should go and do something else. This is going to be a key tension in the expansion. Are some Sylvari immune to Mordremoth's influence? If so, which, and why? Laranthir seems trustworthy, and agreeing to his mission reveals that Mordremoth is particularly interested in capturing Sylvari, but what does that mean? A bigger question is what happens if the player is Sylvari? It's one thing choosing to help Laranthir as a human, but how would the same scenario play out if the player was equally suspicious? ArenaNet is staying tight-lipped over the exact details, and the demo build wouldn't let me create a Sylvari (or any non-human) character. My hope is that the story extends beyond some alternative dialogue. It's unlikely decisions will be too drastic—with no open-world PvP it's not as if players could decide to join the dragon's forces—but it will be a waste if the expansion can't explore that tension in some new and interesting ways. After the instance, I'm let loose in a new zone. At least, I'm let loose in a tiny section of the bottom-left of a new zone. Immediately, stuff is happening. I spawn by what the game calls an 'Outpost,' a series of public events centred around a single area that players must protect. First up, killing things. Five huge Mordrem Breechers are roaming around a rocky outcrop. Above us, a parallel event encourages supporting players to grab sniper rifles and provide covering fire. They can't hurt the main targets, but can do huge damage to additionally spawned enemies. As the last Breecher is downed, a cutscene plays. Helicopters attempt to fly away, but are cut down by a massive vine that weaves through the rock. Our new job is to grab explosives from the downed choppers to lay at the base of the vine. It's fun, in a chaotic way. A lot of the events channel encounters that will be familiar in the Silverwastes—the zone introduced during the second half of Season 2. We're beset by Mordrem Wolves, Husks and Trolls, and helped out by a supporting cast of Pact soldiers. Once the vine is cleared, the remaining helicopters can transport us to the final event of the cycle. It's a boss fight against a Legendary tier Wyvern on a large metal platform suspended by vines. We spawn above the platform, and use hang-gliders to drift into the fight. The Wyvern is a challenging boss fight, and all the better for it. There are no special systems in play—this isn't another Twisted Marionette or Tequatl—but I'm frequently forced to dodge its napalm-life flame breath. The fire sticks to the metal platforms and continues to burn, reducing the safe space we have to move through. Periodically, the Wyvern takes off and lays down strips of fire, dividing us into sections and making it harder to resurrect downed allies. If that wasn't enough, it will flap its wings—knocking down players and pushing them back. More than once, I'm caught by this attack too close to the edge and knocked off the platform. Through a combined effort (and after more than a couple of deaths) we take the Wyvern down. A helicopter arrives, and I can return to the main map by speaking to either of two NPCs. One is Laranthir, the other the anti-Sylvari soldier. 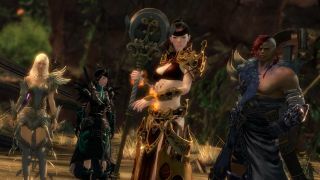 It's hard to say if this decision has any lasting impact, but it seems as if ArenaNet is trying to bring story threads out of the instances and into the open world. Speaking to either Pact member has the same effect, so the choice is a statement of player intent. Do you stand with the Sylvari or not? Back in the demo area, I take to wandering around. ArenaNet has talked about the three biomes of the jungle, and it's possible to get a sense of how this will manifest. Above me is the canopy, filled with the wreckage of Pact airships. Below, thick vegetation hides ruins and small angry lizards. Both lead to areas outside of the demo area, and so there was only the suggestion of how they might look. It's likely that each layer will become more distinct the further players get into the zone. Hopefully that'll give the hang-glider some more use. In the demo, it provided little more than a showy entrance—a choice between gliding a small distance or running around an only slightly longer path. In fact, the only place in the demo that necessitated its use—the jump down to the Wyvern's platform—gave all players a hang-glider prompt whether they'd unlocked it or not. Completing the Outpost event chain unlocks an "Adventure" challenge. These are new, but can be thought of as a solo version of Guild Missions. On activating the adventure, I'm equipped with a flamethrower and asked to torch a number of tendrils before the timer runs out. It's a basic challenge mode, but one that makes for a passable diversion. On the next page, Masteries, the Revenant and PvP.